Team building techniques, activities and programs provide valuable team building tools that a leader should leverage. Teamwork really comes down to dealing effectively with people. As an experienced leader you understand that good relationships are the key to long-term success. Team members will not realize their full potential if they are unable to create and maintain quality relationships. Success or failure for any team is essentially a matter of human relationships - working or not working. Managers use various team building techniques to encourage team members to build strong relationships with each other. Developing trust among team members provides a firm foundation for the entire team. Team members need to be able to speak their mind, without worrying that another member of the team will become upset or feel threatened. This can only occur when team members trust each other and know that everyone is seeking the best solutions. The most valuable employee is the one who develops strong and positive relationships. Imagine having a team consisting of individuals who are talented, self confident, good communicators and where all members of the team trust each other. With an amazing group of people in place, just think about how much you could multiply your own results! Team Player: Great employees are excellent team players. They work well with other members and help each other to achieve team goals. Generous: Great team members are not as concerned about getting individual credit as they are in the team achieving success. Results-Focused: Successful team members are highly focused on actual results. They do not put a lot of value on coming in second or third, they have a high desire to be part of a Winning Team! As an experienced leader, we need you to SHARE YOUR STORIES and team building techniques, tips and best practices. Share your team building ideas and tell us about team building tools and resources that have helped you to create a great team. Great people are very big on taking personal ownership of completing key activities and they are willing to take full responsibility for the outcome, positive or otherwise. To put the icing on the cake, they also genuinely love what they do and they enjoy working for the organization. Being an experienced team leader, you may have made some of these mistakes early on in your career, and learned the hard way. Perhaps you can add some perspective on these issues? Please share the hiring tactics and/or team building techniques that have worked for you, for the benefit of aspiring leaders all around the world. VIEW THE SUBMISSIONS OF OTHER READERS for examples of what we're looking for. As a leader, your team is a direct reflection on you, for better or worse. You need to make certain that your team members are representing you and company well at all times. How do you ensure your team members clearly know what you expect, and how do you INSPECT WHAT YOU EXPECT? How often do you meet with your team? Do you have a standard agenda? If so, explain the flow of your team meetings as well as the planned outcome. How much time do spend one-on-one with each team member? Why? What is the intended result of these meetings? What team building techniques or best practices do you leverage to ensure great teamwork? How do you address performance issues? For instance, when a member of team isn't doing their part, how do you deal with the situation? What would you say to a manager who currently looks at certain members of her team and wishes she never hired them in the first place? What advice would you share? How do make sure that people are having fun in the workplace, while maintaining their focus on producing great results? There are too many subjects around team building to list here, but you get the idea, right? Just ask yourself what you wish you would have known back when you managed your first team - then, simply share your thoughts! If you find yourself having the same conversation with the same person about the same thing - it's time to have a different conversation. Great leaders establish a workplace environment that supports self-motivated people to learn and grow. Great team leaders use whatever team building techniques they can find to make certain that every member of the team is given the opportunity to add value, and is held accountable for doing it. How do you provide a winning work environment for your team? New managers don't always understand that employees do not quit organizations - it's more common that they quit their managers. This is why it is so imperative that you share your wisdom on what it takes to become a great team leader. Tell us about your team building success. A lot of people need to know how you do it! Share Team Building Tips & Best Practices! Developing a strong team is key to your success. What advice can you offer? To submit your story, best practice or team building tip - complete the form below. 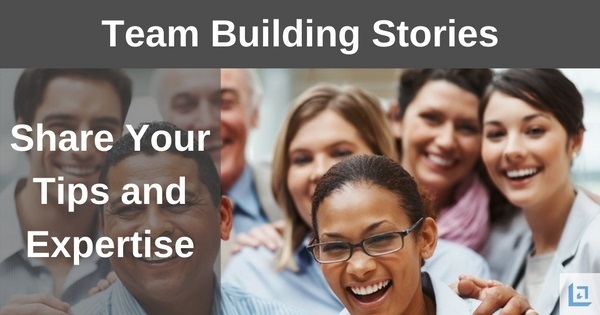 Your team building story will appear on a Web page exactly the way you enter it here. You can wrap a word in square brackets to make it appear bold. For example [my story] would show as my story on the Web page containing your story. Too often, leaders don't take the time necessary for finding the right person to fill a key position. They don't realize that every position is a key position. Hiring a team member is one of the most important, and sometimes most difficult, things a leader does. But the extra effort taken to identify and hire a great team member will pay off ten-fold for years to come. New managers must resist the temptation of hiring quickly in order to "fill the position". Instead they need to see this as an opportunity to HIRE UP. In other words, you must seek to improve upon the quality of the person that you are replacing. There is always someone out there who can add even more value to the team. Always. Hire carefully. Personnel is your largest expense so you must be certain that the organization is getting the greatest return on investment. Being an experienced team leader, you may have made some of these mistakes early in your career, and learned the hard way. Perhaps you can add some perspective on these issues? Please share the hiring tactics and/or team building techniques that have worked for you, for the benefit of aspiring leaders all around the world. Surprisingly some of the best people out there, aren't quite sure why they have been so successful. Using team building techniques and tips you can share your expertise and help others recognize the success traits that you look for and that ultimately determine why you choose certain types of people to be on your team. Each team building submission we receive is reviewed and, upon approval, added to our list of team building contributions. Thank you in advance for submitting your team building techniques, best practices and success stories.